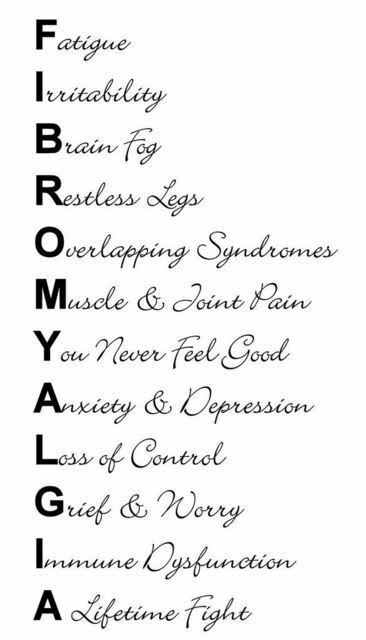 Many people think that Fibromyalgia means you are simply tired all the time. In fact, Fibromyalgia (fibro) – a chronic, painful condition that affects more women than men (a 9 to 1 ratio!) – is more about its vast, pervasive behaviour that consumes your entire body and mind rather than it is about simply being tired. During the last ten years or so, new information regarding Fibromyalgia has become widespread, and more and more doctors are finally catching on that Fibromyalgia is not just in a woman’s head. What I’m writing about today is my personal experience living with Fibromyalgia and it’s common partner-in-crime, arthritis. These are two hidden, chronic conditions that I have had for more than 15 years. Fibromyalgia comes with its own set of unique rules when it comes to exercise and daily routine and, well, basically every aspect of my life. I wake up most mornings feeling like I’ve been hit with a baseball bat to the back or, some days, all over my body. I wake up feeling more fatigued than when I went to bed. I go to school and push through it. Sometimes, though, I can’t move a muscle. I have chest pain that feels like I’m getting stabbed in the ribs, and it hurts when I sneeze or cough…or when I move around. Some days are worse than others. Hugs hurt. It feels like every rib is being crushed. I feel like a 90-year-old most days. I can feel every joint in my body. Flu-like symptoms when I don’t have the flu. Even the simple act of changing clothes is painful. Random, everyday things are painful, such as grabbing a sweater from the closet or cutting food with a knife. Physically debilitating depression. I’m not talking about crying because of momentary sadness. What I mean is, like, staying in bed and staring at the ceiling for hours because your body feels as if it weighs 800 pounds, and you lie there hoping you don’t have to talk to anyone, and wishing the pain would disappear. For some people, depression occurs because they feel isolated and blamed for bringing on their own condition. I have unavoidable weight gain from medication. I eat fairly healthy (better than most people I know! ), yet I am considered “overweight” by traditional medical standards. Pinched nerves and random body pains make it impossible to do anything writing or school-related for long periods of time. I fight the urge DAILY to avoid seriously unhealthy coping strategies that temporarily alleviate or help to escape the pain. Many people with fibro have a constant battle with opiates (most are not really designed for long-term chronic pain) that their doctor prescribes and/or the spiral into alcohol or lethal drug addiction. Neither is a healthy route to take, but addiction and trying to mask the pain are common coping behaviours among those with fibro, and most forums I’m a part of discuss this catch-22 to some extent. I have accepted the fact that all of my plans & activities are indefinite. Sometimes I have to push myself to get through something, but I later repay for it in pain, whether the rest of the world knows it or not. Jessica Wawra (Sedated Koala) is not a medical doctor. This post is not intended to serve to replace, nor is it a supplement, to a doctor’s recommendation. Always consult your physician if you have questions or concerns related to your health. 7th grade track coach was my very first experience with the whole “you look fine, just tough it out and stop complaining” phenomenon, even though the pain in my hip never went away. I’ve had many days like yours, including a couple of scary periods I thought I would either lose or have to quit my job. I remember days of planning every physical move to get the most out of it, because I might not be able to do things like reach into the cabinet twice, or go back upstairs to retrieve a forgotten sweater. I think I lost friends because I kept having to cancel things. I’m not healed, but I am better than I was. What helps me is a low-carb, gluten-free, whole foods diet; trigger point massage, chiropractic care sometimes; liquid cal-mag for the restless legs, and a very good anti-inflammatory supplement with MSM, turmeric, etc. Not a single thing a doctor has recommended has helped, but I am very grateful for my chiropractor and nutritionist. Not saying that in a “you should try this” way, because I know how irritating it can be when people assume you haven’t tried their miracle cure they heard about on the internet, or when you have a gazillion “you should try’s” to drain your finances and your morale. Just mentioning it because I hope you can find something that helps you, too. I commend you for not turning to addicting substances–very difficult not to do especially when your doctor recommends them. I hope the new research changes the way the medical professional deals with fibro and chronic pain. This entry was posted on March 18, 2014 by Doralice in arthritis, female, Fibromyalgia, pain.